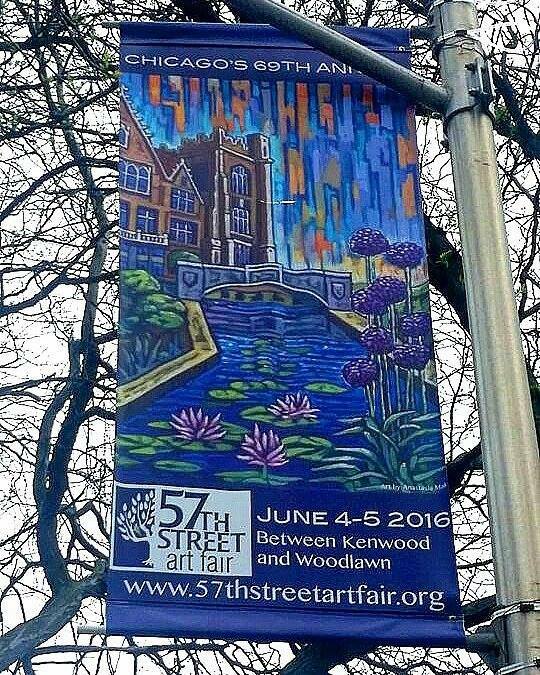 I was thrilled to be invited by the 57th Street Art Fair to create a commission for their 2016 poster and banners. This Fair is a nice show in Chicago’s south side neighborhood of Hyde Park, located not too far from University of Chicago campus. 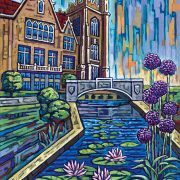 The commissioned project involved creating a painting, completing a poster / lightpole banner design, as well as making all of festival’s other supporting materials (postcards, bookmarks, lanyards, etc) – print ready. 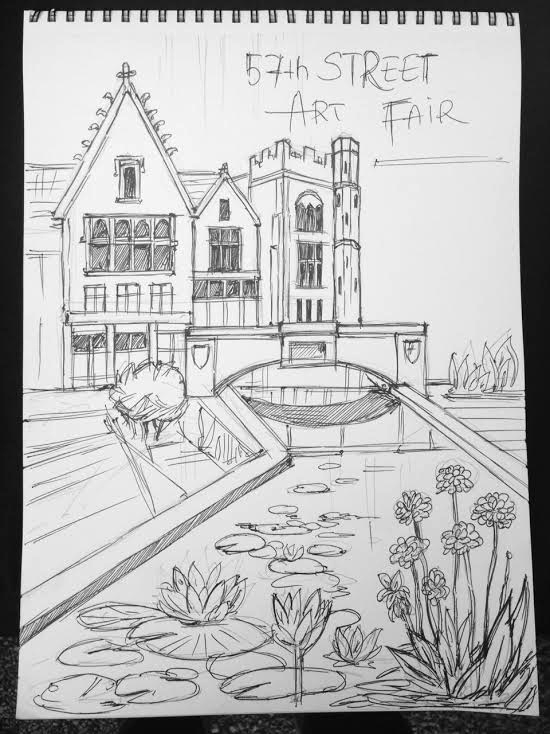 After brainstorming the painting subject matter with the festival committee, we settled on Botany Pond – a serene little water spot in the Main Quadrangle of UIC campus, full of lilies and surrounded by plants and flowers, with a walking bridge over it. 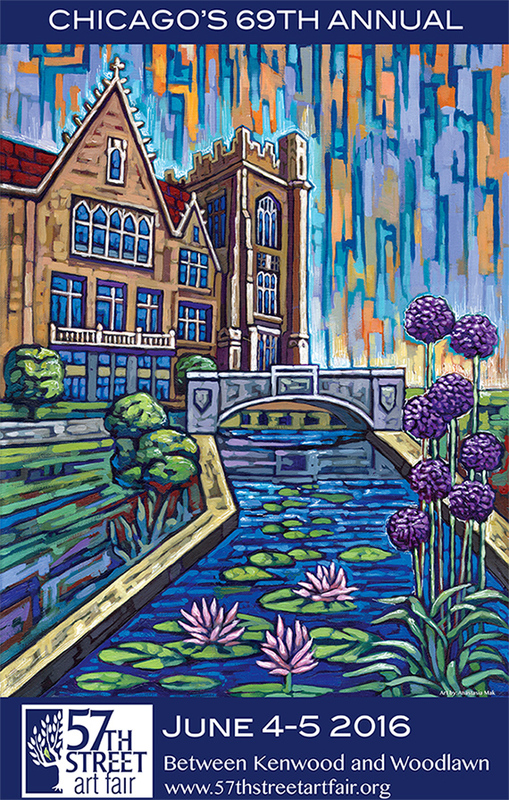 The building I placed behind Botany Pond in the painting is actually located a little further away in real life (on the other side of UIC’s Main Quad). But I chose it for this piece because I found it so interesting. Its gothic style has many little details that are fun to paint, and the right portion of it reminds me of a castle. ….and one of many street lamp banners advertising the festival! What a fun project! I look forward to being there during the show days on June 4th and 5th! Stop by my booth (just south of the info tent) to say hello.